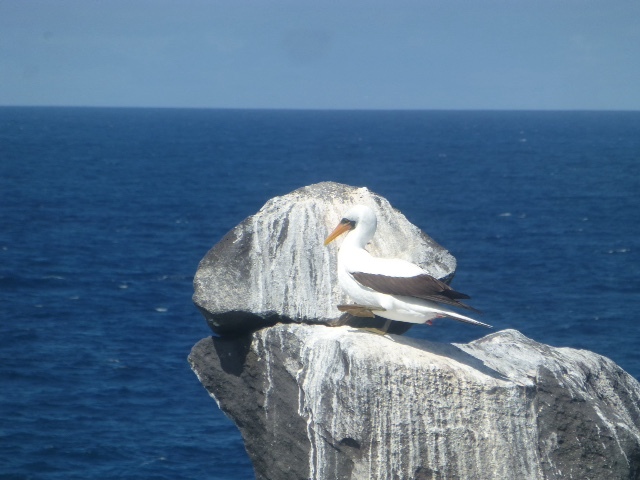 There are about 18 islands in the Galapagos. 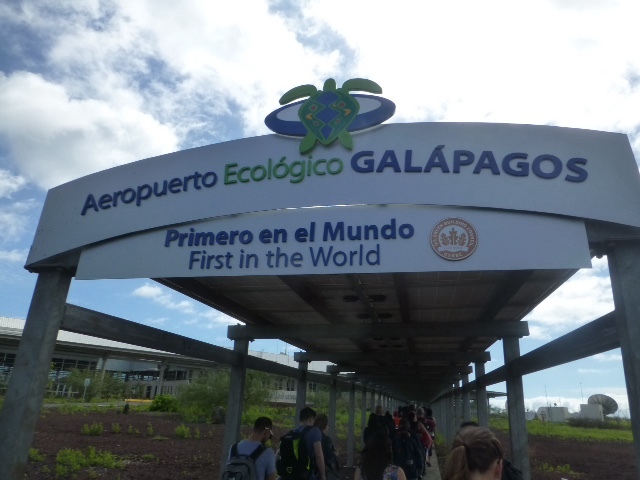 The main airport where we landed as we flew in from Quito is on Baltra. It's a tiny island just north of Santa Cruz Island. 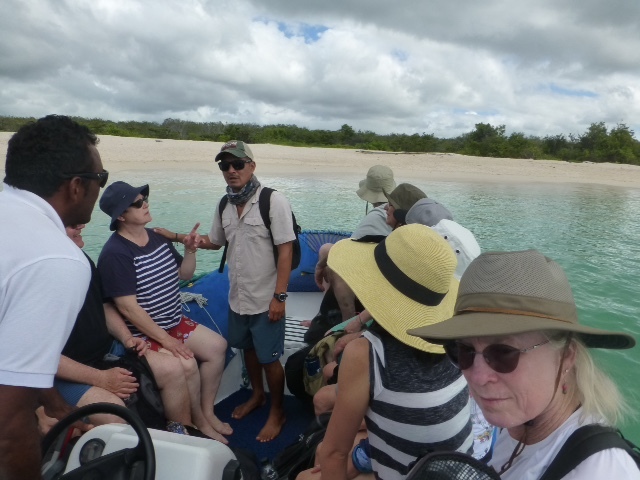 We were met by our nature guide, Andres, a young Ecuadorian fellow born in San Cristobal (Galapagos). He escorted us to a bus and soon after we boarded Nemo I, our home for the next few days. 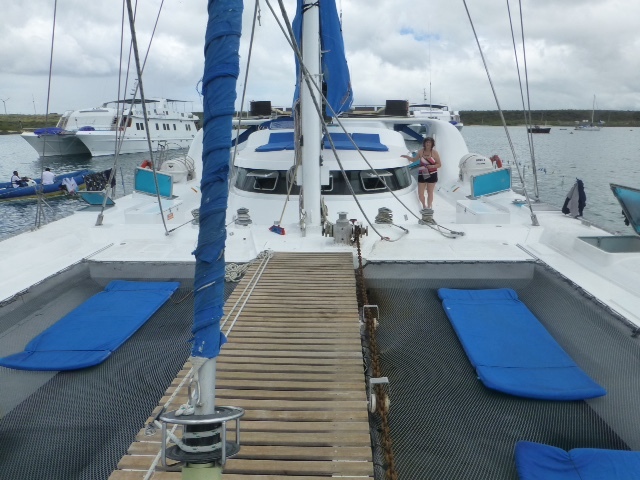 Our trip in the Galapagos was made on a catamaran. 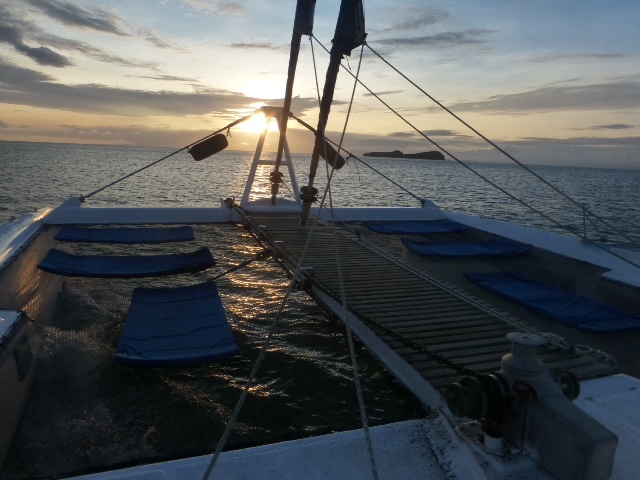 We visited the islands of Santa Cruz, Isabela, Floreana and Espanola. 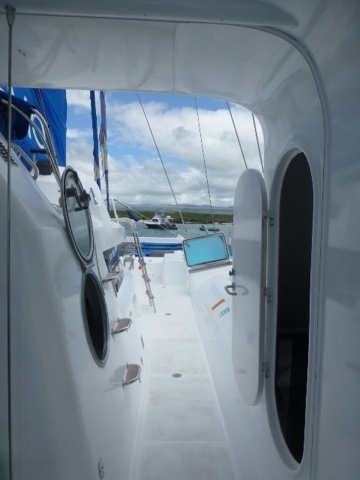 Nemo is an 83' catamaran with 7 staterooms. 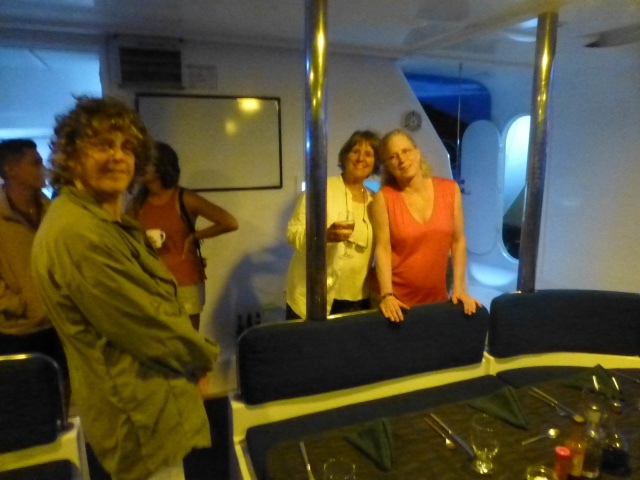 We had 14 guests and 6 crew. The accommodations were tight but comfortable. 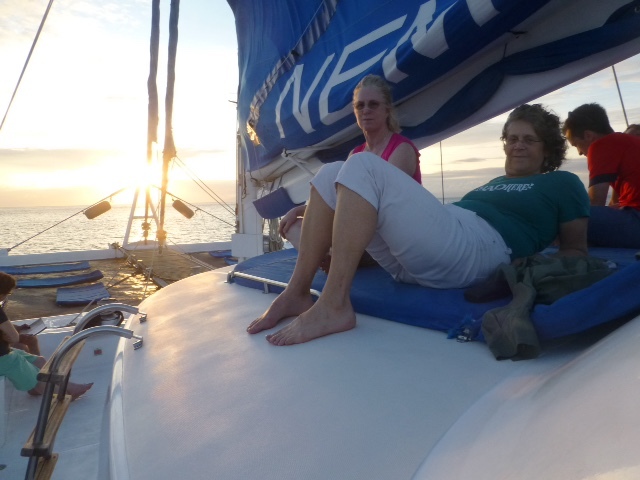 There were all sorts of areas on deck to sprawl out on to relax. This was the entrance to our stateroom and one other room. 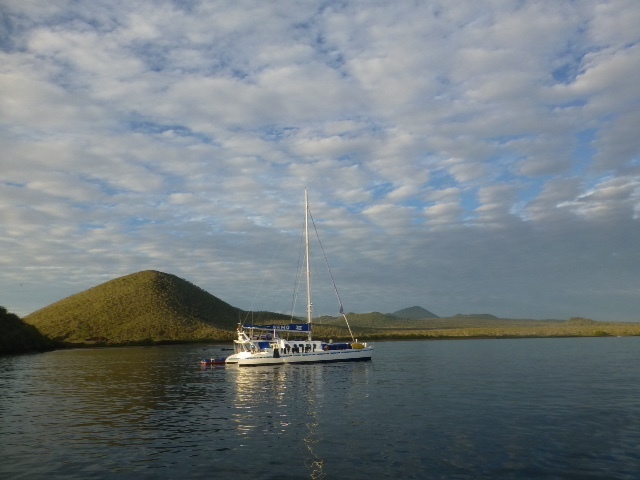 As we visited islands, we were taken ashore in a big inflatable with an outboard. We had, what they called wet and dry landings. 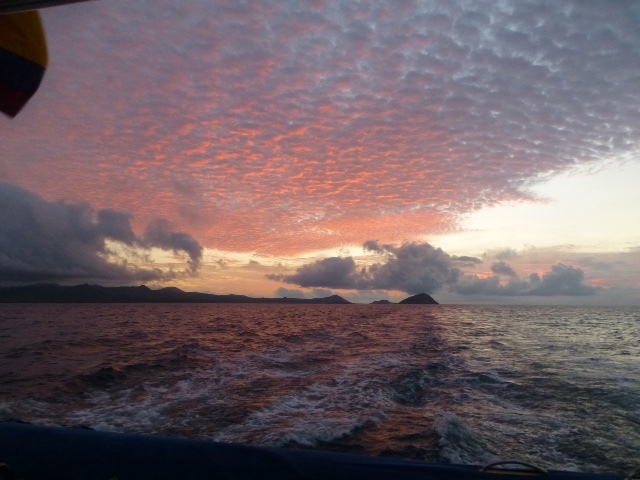 The wet ones, were usually when we went snorkeling, while the dry ones usually occurred when we were going on a hike. 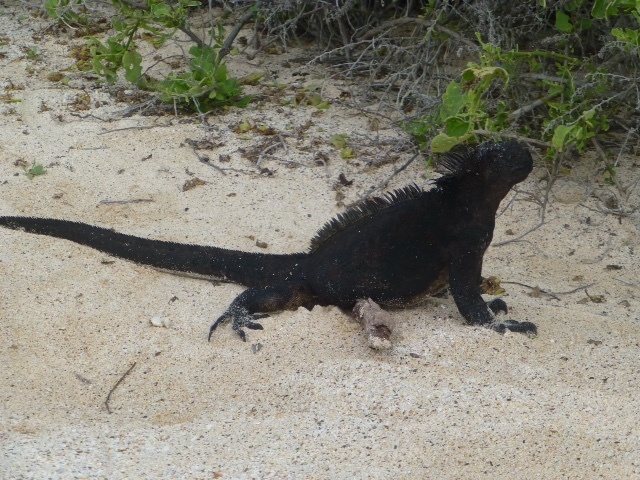 The first sight of an iguana got a lot of attention. 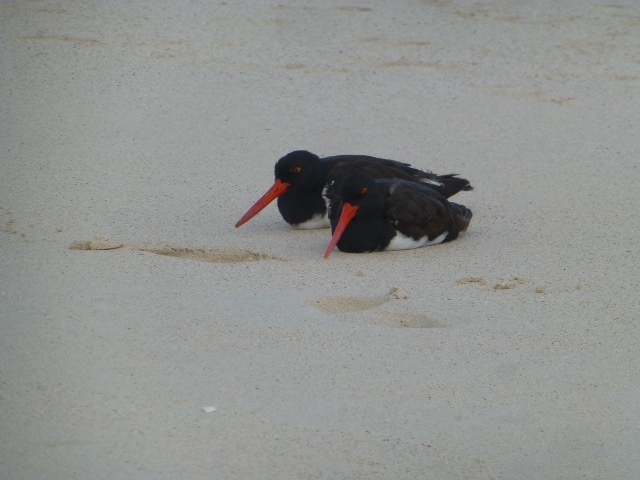 But after a while, after nearly tripping on them, the sight of them only generates a yawn. They tend to find themselves sunny spots to soak up the rays. 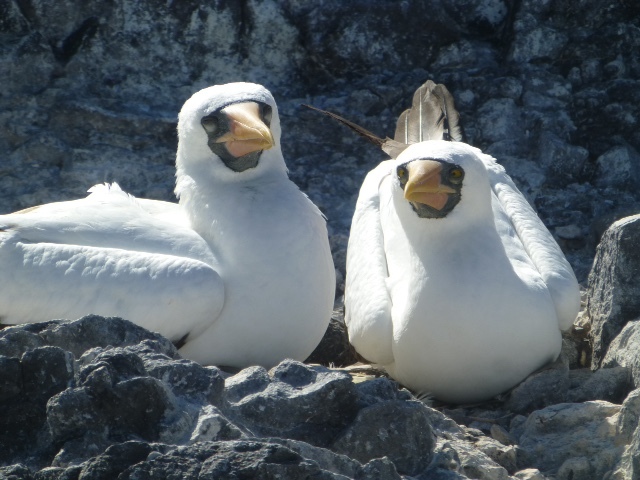 Certainly the most prevalent animal on the islands are the birds. 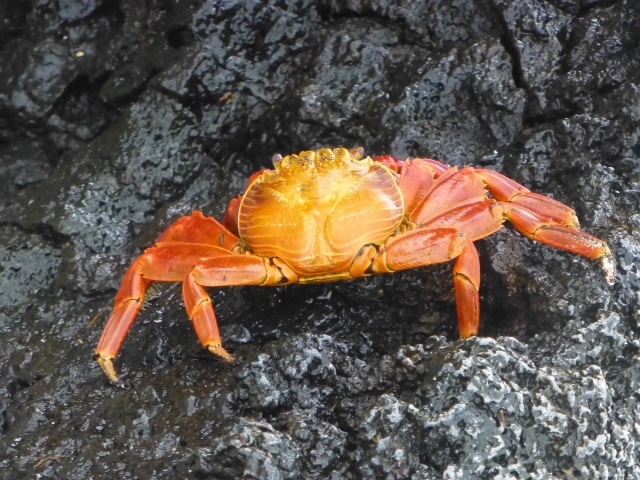 Colorful crabs are ubiquitous and quite a contrast to the dark, volcanic rock. Cathy and Diane relaxing on one of the decks. 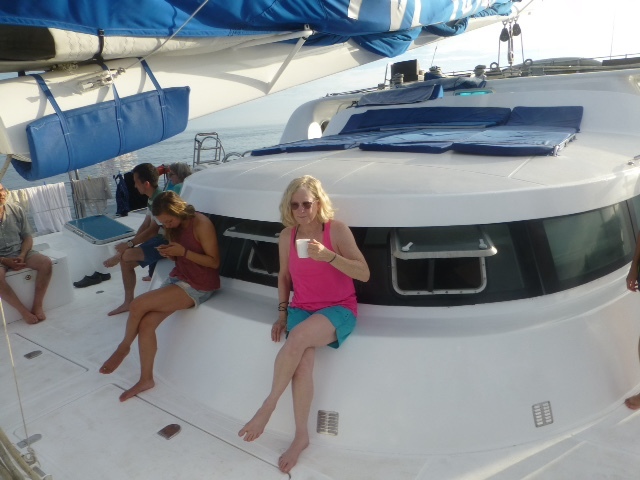 There were comfortable mats to lounge on that were tied to netting between the hulls. The food on board was good and plentiful. Breakfast was served at 7am, lunch at 2pm and dinner at 7pm, with snacks in between. A bottle of beer was $4 and a Concha I Torro bottle of wine was around $35. No one got inebriated. 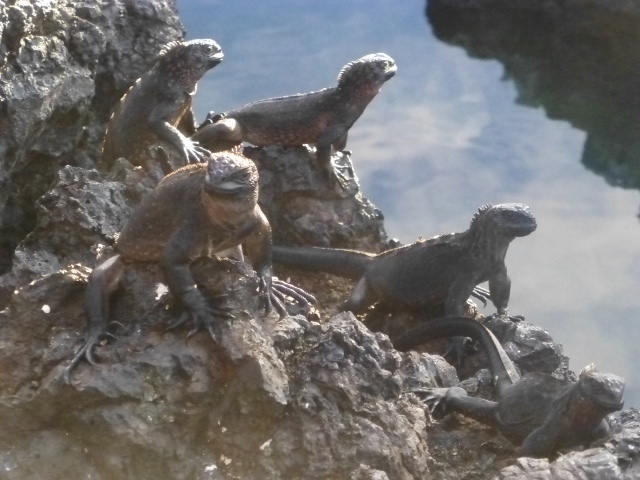 Some times there were dozens of iguanas sunning themselves on the rocks. 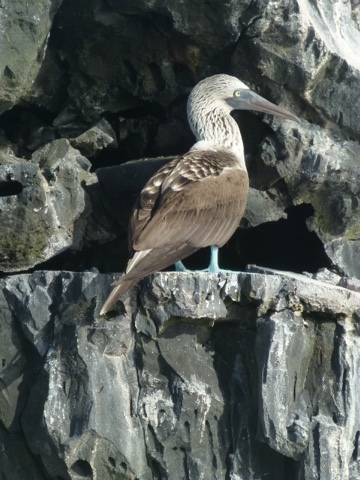 The famed blue footed boobie bird. 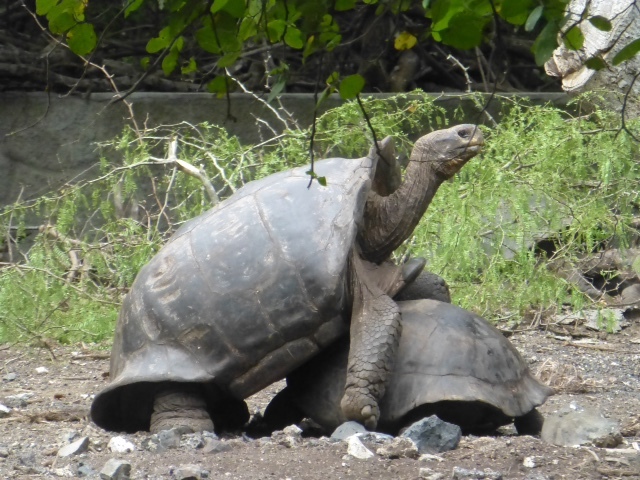 We visited a tortoise research breeding center where the famed George used to live. 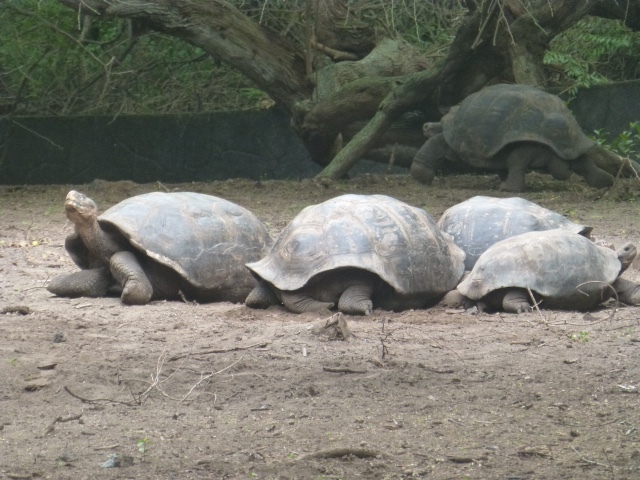 These tortoises grow to be 150 years old. An attempt at breeding taking place. 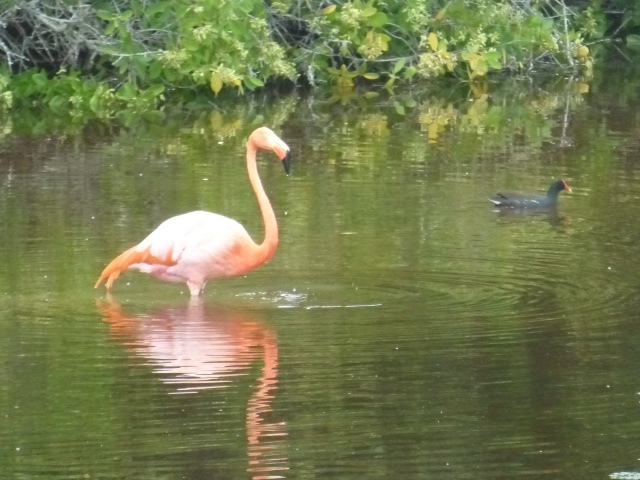 The islands have numerous flamencos. They get their color from eating a pink shrimp, proving once again, you are what you eat. 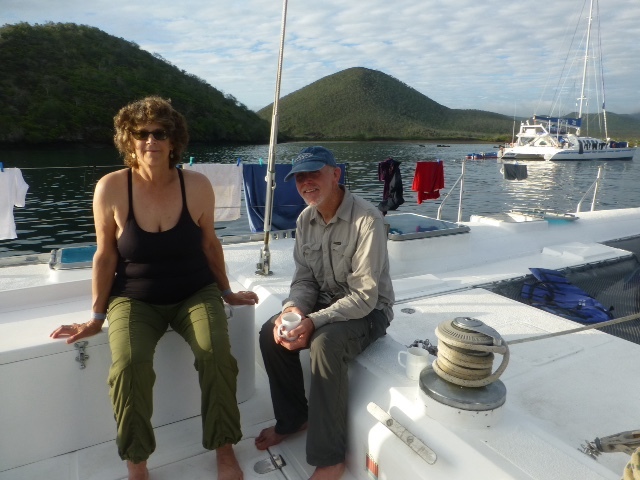 Tom and Cathy relaxing on Nemo. Diane getting her first cup of coffee in the morning. 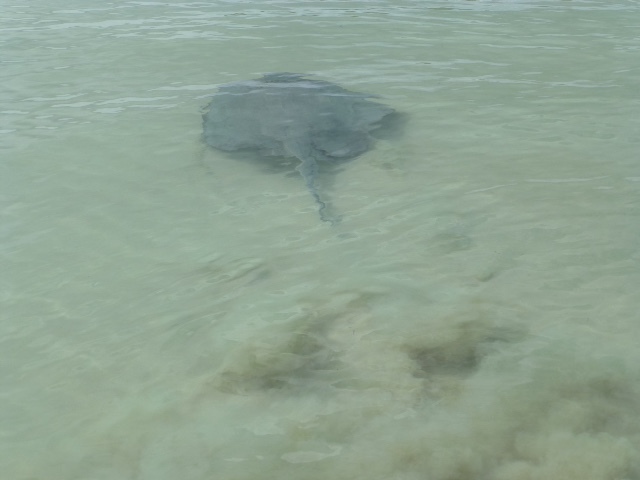 There were numerous sting rays on one of the beaches we went to. 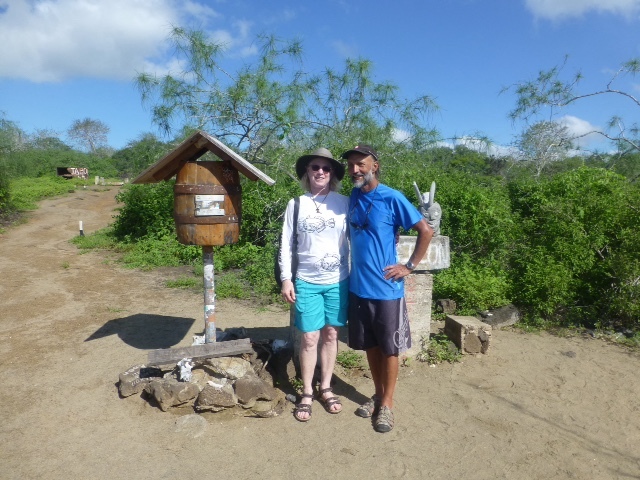 On the island of Floreana, we visited the Post Office. This is where mail used to be delivered to for the German families who home steadied the island in the 1920's. First a dentist and his mistress moved to the island, followed by another family soon there after. Then a German "Baroness" moved there with her two lovers. She proclaimed here self Empress of the Galapagos. All didn't go well with these folks and murder ensued. Underway, Nemo is quite fast, capable of cruising at 10 knots. 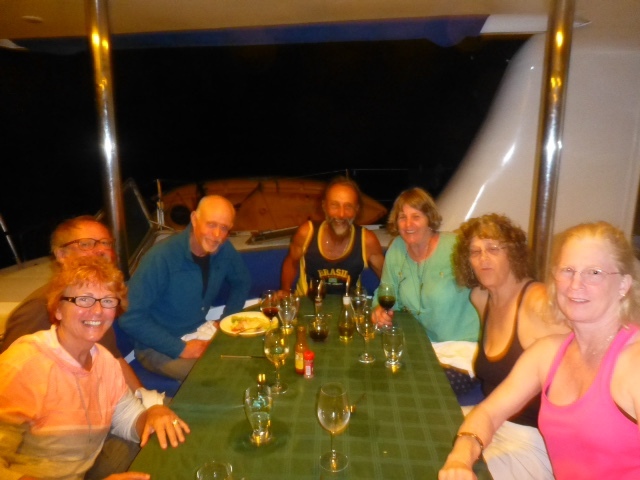 At the dinner table with some of the other fellow passengers. 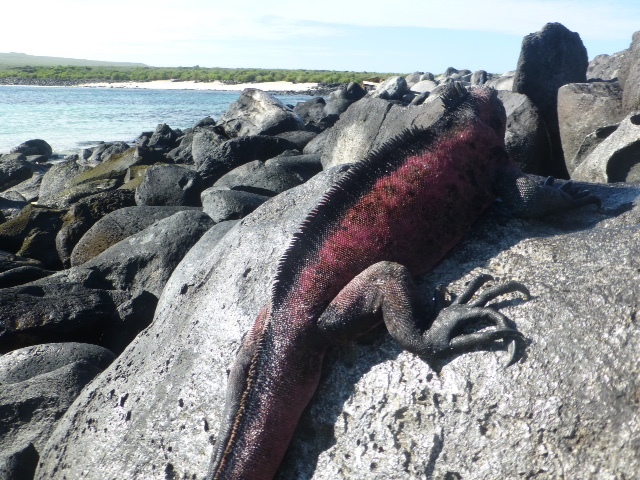 The reddish color of the iguanas on Espanola is due to the red algae they feast on. 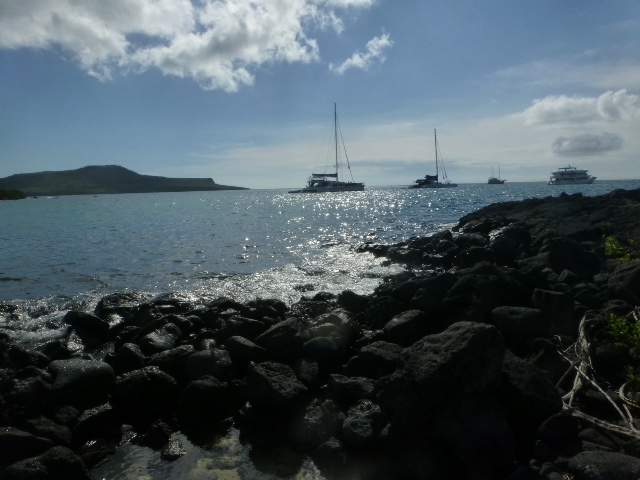 After Espanola, we went to the southern end of Santa Cruz island, where the town of Puerta Ayora lies. 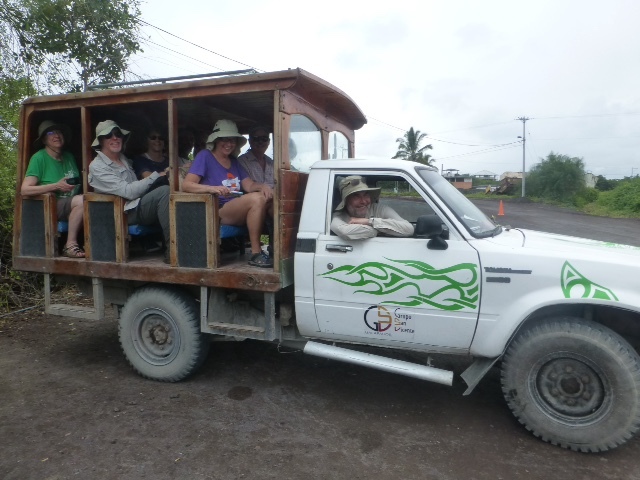 From there we took a van into the highlands, stopped to visit another farm where the giant Galapagos tortoise is found. From there we headed to the airport on Baltra for our flight back to Quito.